Jose Petronio Katigbak with wife. Image source: Renz Marion D. Katigbak. Colorized courtesy of Algorithmia. Regular readers of Batangas History will know that there is an impressive list of brilliant Batangueño intellectuals who made names for themselves in various fields of endeavor during the American colonial era in the Philippines: Gregorio Zara, Maria Orosa, the Kalaw brothers Teodoro and Maximo, Antonio de las Alas, Fidel Reyes and Pablo Manlapit, to name a few. To this list we now add Lipa-born Jose Petronio Katigbak, the first known Filipino student of the renowned Harvard University in Cambridge, Massachusetts. ;He was born on 4 October 1879 to Mariano Katigbak and the former Isabel Macarandang. 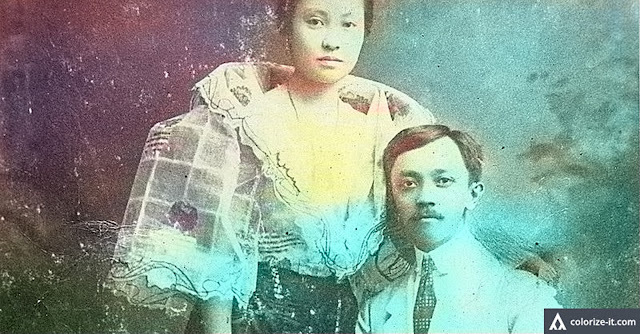 As was typical of children of many of Batangas’ prominent families in the 19th century, Katigbak was initially educated in Manila at the Jesuit-run Ateneo de Municipal. In 1896, he would obtain a degree in Bachelor of Arts at the University of Santo Tomas, enrolling afterwards at the same university to study medicine. Engineering, however, was more his calling; so off he went to Europe where he enrolled at the King’s College of the University of London. In June of 1903, he obtained from the university an associate’s degree1 in Civil Engineering2. Later that same year, he transferred to the Lawrence Scientific School of Harvard University. Already in possession of an associate’s degree, he was admitted into Harvard’s Civil Engineering program as a senior and within a year he would obtain his bachelor’s degree. He would then take up a special course in Plane, Railroad and Geodetic Surveying, all the while working and getting valuable experience as a draftsman, surveyor and designer at a Massachusetts company. While at Harvard, Katigbak was not just a student of engineering but also embodied the characteristics of a Filipino patriot and nationalist of the era. After one Fred Atkinson delivered a paper on Philippine education at Harvard’s Brook House, he stood up and spoke for “almost half an hour” to correct inaccuracies in the paper. The state of Philippine education was something that Katigbak was familiar with, having taught at the school Instituto Rizal in Lipa just before he left the Philippines for Europe. 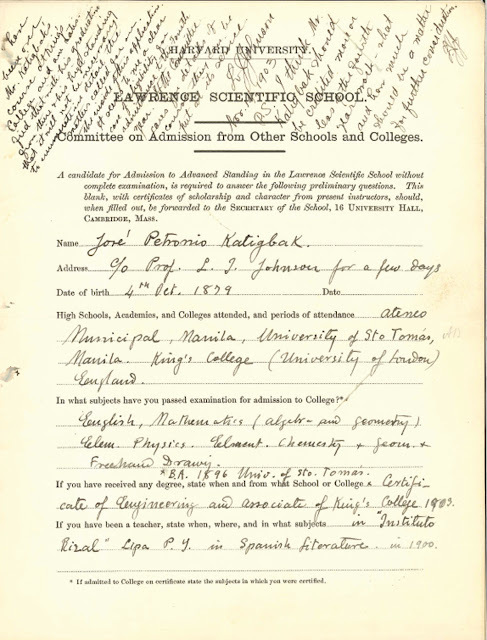 Jose Petronio Katigbak's Harvard Admission paper. Image source: Renz Marion D. Katigbak. Upon his return to the Philippines in 1905, he quickly obtained a position at the Bureau of Public Works and was key to the creation of the city of Baguio’s layout as prescribed by the American architect and urban planner Daniel Burnham. The following year, he would transfer to the City of Manila’s Department of Engineering and Public Works, under whose employ he would remain until his death. Whenever the City Engineer of Manila returned to the United States for “considerable periods,” Katigbak was given full charge of the city’s Engineering Department, such was the esteem with which he was held. Despite his busy schedule, he somehow still found time to do volunteer work for social causes, mostly with the YMCA5. Katigbak, who had been described as of “brown complexion, slight stature and frame6,” was nonetheless a giant in terms of his moral uprightness, his honesty and hard work. Even as a young man, he was already known as one who possessed “a strong character” and followed a “stern code of honor7.” He had been, however, also described as being of “a very happy disposition” and had many personal as well as professional friends. He belonged to a rare breed in the sense that he excelled not just in the technical but also in the artistic as well. He was a poet and writer whose work Teodoro M. Kalaw – another great Lipa-born historical figure – ranked as among the “best in the world8.” He was also a painter, philosopher and an educator. Unfortunately, all the hard work he put in at the City of Manila’s Department of Engineering and Public Works, along with his numerous volunteer and other civic activities, put a strain on Katigbak’s health. In 1916, he returned to Lipa for what was supposed to be a recuperative vacation, but was instead struck down with typhoid fever. He returned to Manila to seek medical help but by this time his state of health had so deteriorated that he succumbed to the disease on the 16th of May. He was not even 37. Such was the esteem with which he Katigbak was held that an estimated 20,000 people turned out for his funeral procession; and among the honorary pallbearers the city mayor and members of the municipal board, heads of city offices, justices of the Supreme Court and prominent citizens. 1 An associate’s degree is an undergraduate academic program that ‘aims to give students the basic technical and academic knowledge and transferable skills they need to go on to employment or further study in their chosen field.’ “What is an Associate’s Degree?,” online at QS Top Universities. 2 Along with other details of Katigbak’s early life, education and career, from “Memoir of Engr. Jose Petronio Katigbak, Transactions of the American Society of Civil Engineer, Volume 8, pgs. 1803-1805,” published 1917 by the American Society of Civil Engineers. 3 “A Filipino Student Replied,” published February 1904 by the Cortland Evening Standard. 4 “He Hustled the East,” by JM Groves, published 1915 in Volume 41 of “Young Men” a magazine of the YMCA. 6 Cortland Evening Standard, ibid. 7 “Few There Were (Like my Father,” by Maria Kalaw Katigbak, published 1974 by the Teodoro M. Kalaw Society. 8 Maria Kalaw Katigbak, op. cit.